What is it about a visualization that attracts people’s attention and of that what information is encoded into memory? In this study, researchers designed an experiment consisting of three phases: participants were shown visualizations for 10 seconds, participants then signaled that they recognized a visualization, and wrote descriptions of what they recalled about a visualization. The most recognizable visualizations had a clear center of interest. Eye-tracking software determined that the most recognizable visualizations in the experiment all had a single focus in the center indicating quick recognition of the visualization, whereas the least recognizable visualizations had less singular fixation patterns. Clear titles and text help recall the message. Across all textual elements, the title is among the most important. 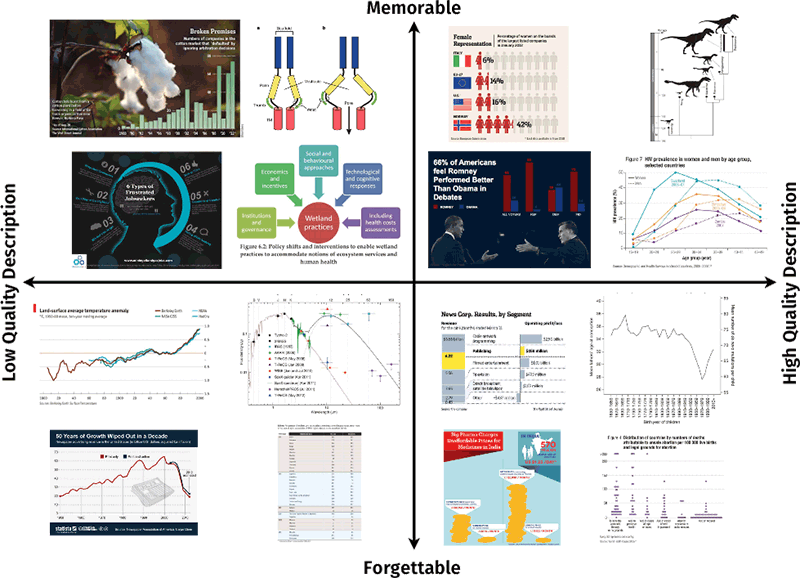 Specific titles reinforcing the visualizations main message often aided recall. Visualizations with non-specific titles can benefit from other explanatory texts such as paragraphs and labels. And visualizations with titles at the top, above the visualization also improved recall. Related, recognizable images can help memorability. When objects provide ‘message redundancy’ they often improve the visualization’s memorability. However, objects unrelated or unclear to the visualization’s message can confuse or misdirect a viewer’s attention. Objects can include photographs, pictograms, and realistic or abstract outlines of human recognizable objects in an image. Visualizations that are memorable “at-a-glance” have memorable content. When these visualizations are retrieved from memory, many details of the visualization are retrieved as well.